Before we talk about website heat maps, let’s talk about people. There are two kinds in the world. Those who see A/B testing (and Conversion Rate Optimization by extension) as gambling and those who see it as science. Gamblers want quick wins; they resort to best practices without bothering with research. The scientists, however, are methodical; they follow a structured process that’s designed to get results. I won’t call one wrong and the other right, but I’m helplessly biased towards the scientists. Problem Statement: What metric are you trying to improve, on what pages? Establish a baseline and evaluate the possible improvement. Research: Understand current user behavior through analytics and usability testing. How long should you run a test for statistically significant results? Hypothesis: Based on the research, zero in on ideas that would improve your preferred conversion metric. Let’s talk about Research. It forms the backbone of testing, giving you hard data to reveal where exactly the copy or design might be costing your business. Which page along the funnel? Where (and what — copy or design?) within the page? You already know how to figure out the answer to the first part. There’s Data Analytics for that, it’s sorted. Data analytics, such as Google analytics, helps you answer which stage along the funnel you should test. It reveals the macro view — what percentage of your visitors abandon their journey at each stage (page) of the conversion funnel, or which pages engage visitors least. Okay, great! Now you can prioritize based on what pages need immediate attention. Bang! It hits you that you are not entirely sure what exactly to test on the page. But, no matter! What are instincts for anyway? Who doesn’t mind endless testing, guessing and double-guessing what might work! 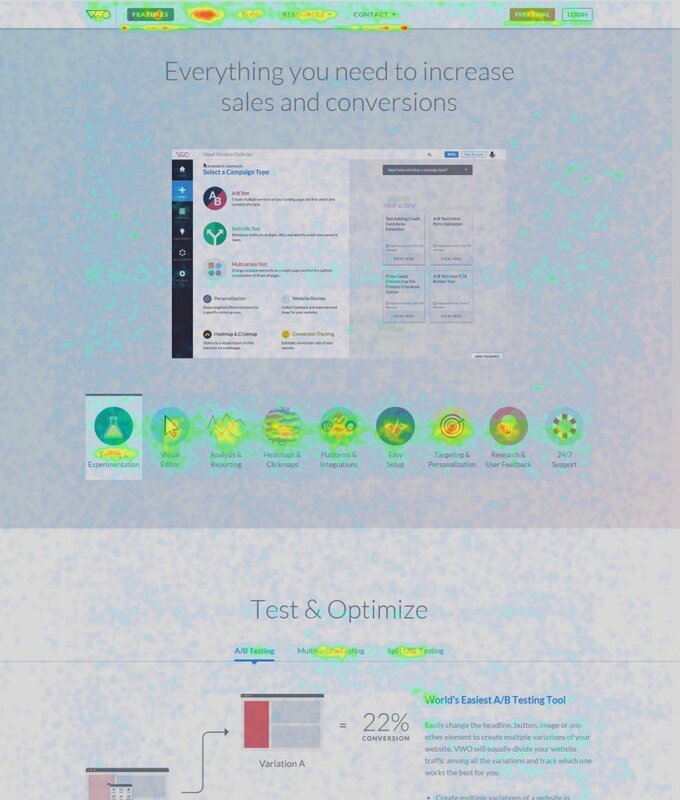 Or, if you want to start finding winning A/B tests more often, shake hands with visual analytics. 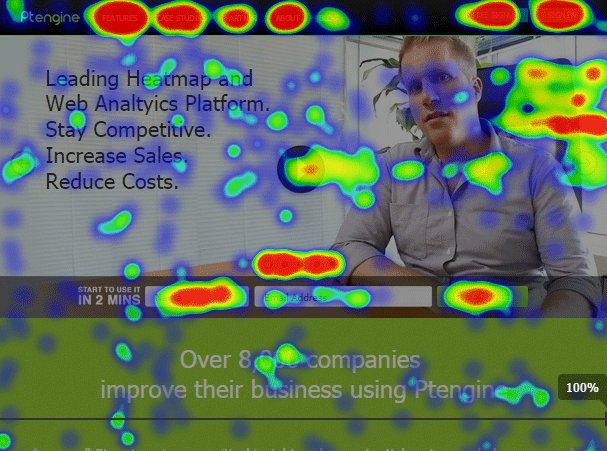 With the help of heat maps, visual analytics show how users engage with a webpage. It tells you what your users see on the page, what they react to, what affects them..a poet might even say, heat maps help you read customers’ minds. Data analytics can show what pages require attention, but it does not show what part of the page needs mending. For instance, a high bounce rate on a page (that forms a part of the conversion funnel) shows that there might be something off with the page because users are exiting the funnel from these pages. 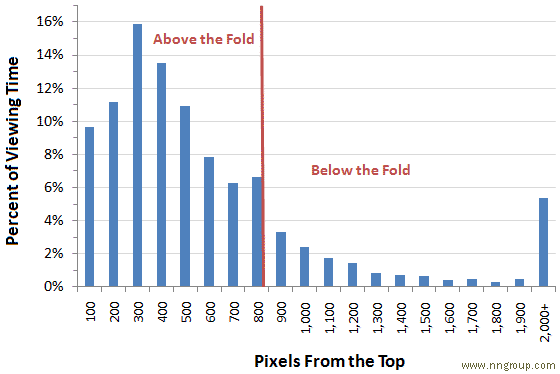 Visual analytics sheds light on WHY visitors leak off of your website. Eye-tracking: A form of user testing where you select a sample size of your website’s user population and track their eye-movement as they engage with the flagged webpage. It’s fairly expensive and since the test itself is done only on a sample of your population, the results might not always be reliable. Mouse-tracking: Mouse-movement and activity of all visitors to a site are tracked over a period of time and represented graphically. One question that pops is how good an approximation mouse-movement is of eye-movement. Studies comparing mouse-movement and eye-movement have found that the average distance between cursor and eye gaze is 90 pixels, and 40% of those times the distance was less than 35 pixels. Depending on what you are trying to discover, you can employ different heat map tools. Here we look at the most popular of such heat maps and how they help in identifying barriers to conversion. It’s the closest alternative to an eye-tracking test. Mouse-movement tracking tools track mouse-movement of all your users and then represent the data visually over the page. It reveals patterns behind how users read and navigate the page. Here’s a look at how the mouse map looks for VWO Features Page, as generated by Navilytics. Most mouse-movement maps also give analytic data like how many visitors hover over a particular area of the page, which is an indicator of the attention such page-areas command. Are guarantee badges getting enough attention? Should they be moved closer to the add-to-cart and/or checkout button? Are users failing to see the ‘free delivery’ promise, with little to no activity in that area? Do visitors hover over the product recommendation carousel? Scroll maps help you understand to what point of a page users scroll and where they abandon the page. Depending on the scroll behavior of users, you can adjust the length of your webpages for maximum effectiveness. For instance, the Nielsen Norman Group have continuously found that 80% of visitors’ attention is spent above the fold. Are visitors missing your painfully designed CTA button that is below two folds? At what depth of the page is most drop-offs happening? Is the content in that part of the page relevant? Should it be rewritten or removed? Where exactly does the page fold lie? Should other critical content be moved up the page to get more attention? Typically, scroll-map tools also display the percentage of users abandoning the page at different points. Using the information that scroll maps give, you can redistribute content, readjust the page layout and test such changes against the original layout. Click maps show you where your users click on a page. Bad design is bad business. Using click maps you can weed out unwanted distractions on the page to streamline user experience. Are there distracting design elements that take users away from the main conversion goals? Is one link cannibalizing another, more important conversion? Forms are the sanctum sanctorum of webpages. It’s where a user becomes a prospect, and later, a paid customer. Your landing page content might be the best in the business, but unless your form is just as good and commands attention and inspires trust, conversions will suffer. Form tester tools help understand how users interact with the form — where on the form they spend the most time hovering, where they click and how they engage with it. Think mouse-movement maps, but for a form. Perhaps, users are hovering over form labels longer than you expect: this might indicate that the label text is difficult to read. Are users spending longer than expected on the form fields? This might indicate poor contrast between the field text and field background color. It’s not just these minor tweaks, form testing can help uncover major issues with form layouts as well. Here are some pointers on optimizing form layouts from Baymard. While heat maps represent recorded data visually, visitor recordings capture actual videos showing a user’s interaction on a page. Visitor recording helps you virtually see over the shoulder of users as they interact with your webpage. It tells you where exactly on the page a user faces issues and what they are most attracted towards, so you can see the visual hierarchy as it seems to a visitor. Surveys and other usability tools aside, Usabilitytools has a neat Click Tracking tool that records clicks on page, clicks on elements and hovers (something they call the ‘attention map’) on a page. You can get a price quote by filling up a form on the website. Mouseflow also has the entire suite of heat map tools with an offering specifically for eCommerce stores where it’s important to capture visitor interaction with dynamic page elements, too. They offer a freemium plan and you can start a free plan for upto 100 recorded sessions/month. Navilytics packs the whole punch and more, with features like Area Stats that lets you select specific areas of the page and receive mouse interaction data and the ability to do data segmentation. Navilytics, too, offers a free plan for upto 50 recorded sessions. Clicktale, largely an enterprise solution. probably the most well-known of heat map tools. The spread is not limited to heat map tools; on offer are specialized tools to help improve site efficiency and conversion funnels. They recommend signing up for a free demo only if there is a minimum of 500,000 page views per month across your website. Okay, I’ll blow our trumpet now. VWO too, includes a heat map functionality that provides both mouse maps and click maps. The functionality comes bundled along with any of the testing plans that we have. Ptengine is another product that offers all typical heat map functionalities and some additional features like multi-device monitoring. They offer a free plan too. Have we missed something? What other ways are you using visual analytics? Be sure to let us know in the comments section below. Marketing | SaaS | Product. Loves words, people, images, and experiences. Very nice article. We have been using Heat Maps with our customers, and our redesigned website. We used a responsive design, which required a long page. We only start to lose interest in the bottom 1/4 of the page, after a few of our Calls-to-action. On the prices page, they scroll all the way down. For any customer that asks us to redesign a website, we always include at least a couple of month of heat map analysis. They love to see it, and they understand the benefits of a properly created page.